A super-green North Wales energy company and its entrepreneurial boss are double finalists in prestigious national awards. 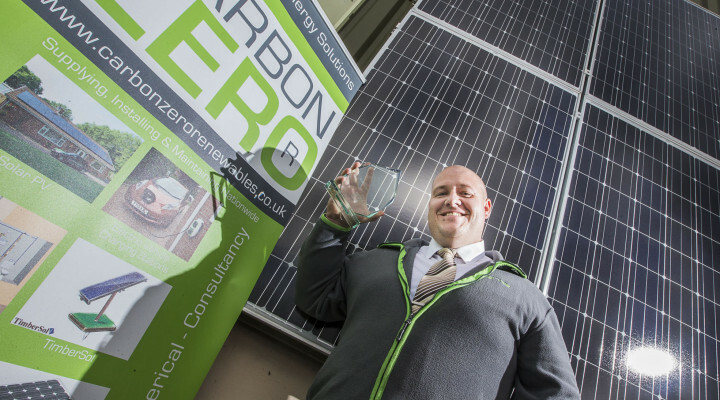 Carbon Zero Renewables based in St Asaph and its managing director Gareth Jones have both been shortlisted for honours in the 2014 Free2Network Business Awards, which aim to recognise, celebrate and promote the achievements of businesses and entrepreneurs from across the UK. While the company as a whole is in contention for the coveted title of Business of the Year, Gareth is in the running to take the Leader of the Year accolade. This year’s award winners will be unveiled at a glittering black tie event to be staged at the St George’s Hotel in Llandudno on Friday, November 28, when the judge and host will be TV personality and entrepreneur Sair Khan who rose to fame as runner-up in the BBC TV series, The Apprentice, which has just begun its latest series. She went on to present a number of TV programmes, including the BBC’s The Money Show, Beat the Boss and The Martin Lewis Money Show, and has created her own natural skincare product range. Gareth Jones said he was delighted to see himself and his company shortlisted for the awards and that a win in either or both categories would “crown a fantastically successful year” for Carbon Zero Renewables. Gareth is no stranger to the Free2Network Business Awards after carrying away the trophy for Businessman of the Year in their 2011 inaugural year. The company has already made a big impression on the international awards scene after being named as solar installer of the year at the prestigious Finance Monthly Global Awards 2014, organised by an influential magazine which has 130,000 readers across the world. Gareth said: “I am delighted that we’ve now been shortlisted in two categories of this year’s Free2Network Business Awards. It’s great to be recognised at national as well as international level for our business achievements. “Hopefully, we’re in with a good chance of winning and if we are successful in either or both of the two categories in which we’re shortlisted it will crown another fantastically successful year for our company. “Sales so far this year have exceeded all our expectations are we are new looking to grow even further in 2015. “We are very pleased to be associated with the Free2Network Business Awards and this will be the third year that we have sponsored the Green Business award. Honours have been piling up over the past few years for Gareth who is a former Institute of Directors’ Young Director of the Year for North Wales. Earlier this year he was re-elected President of North Wales for the Federation of Master Builders. He said: “We’re having a very busy time, orders are up and there’s a lot in the pipeline with a range of domestic and commercial projects. “In recent years people have been wising up to the whole idea of green energy. Gareth also practices what he preaches at his “eco office” in St Asaph. Four solar panels generate up to 50% of the electricity needed to power the heating and lighting. Their office is fitted with low energy LED lighting and infra-red heating panels while extra-thick insulation also helps reduce the carbon footprint. He added: “We’re now offering battery storage systems, so people can now store the power they get free from their solar panels. “We do a range of other energy saving technologies which are not that new to the market but again becoming more main stream. That can save people up to 19 per cent on their energy bills. “One of the next big things is voltage optimisation which reduces the incoming mains voltage down. “All domestic appliances are made for the European market and they’re all designed to run as low as 220 volts. “The problem is that UK electricity supply is at least 240 volts when the appliance actually only needs 220 volts to run properly. This entry was posted in Business, Environment. Bookmark the permalink.